As they begin their seasons, the men’s and women’s basketball teams look poised to have a strong year. Women’s Team: After abruptly ending its season due to a monumental collapse in the opening game of the conference playoffs last year, the 2014–2015 women’s basketball squad is back with a vengeance. The team has started off strong, as it kicked off the regular season with a bang last week via an overtime victory against University of Mary. While the Tritons have a long road ahead of them, the two games played thus far (one exhibition, one competitive) have registered a promising outlook. After losing senior starters in forward Erin Dautremont and guard Megan Perry, a new set of Tritonsalready appear ready to emerge as the leaders of the coming season. Senior guard Miranda Seto, the leading scorer last season, is already looking to elevate her game even further. Seto had a stellar shooting performance against the exhibition game against No. 6 Stanford, tallying a game-high 24 points and racking up a team-high 20 points in the win over University of Mary. Freshman guard Taylor Tanita has also recorded impressive numbers in only her first two collegiate starts this year. Tanita’s offensive abilities may prove crucial down the stretch to lighten the load on Seto’s back. Senior guard Stephanie Yano returns to reprise her role as a routine playmaker and senior forward McKennan Bertsch will be relied on for her fair share of buckets. Perhaps most pressing is the Tritons’ lack of presence in the paint. While UCSD has always been an outside-shooting team, senior center Dana Webster will need to step up down low to maintain a larger presence for the undersized Tritons. Coaches: Heidi VanDerveer returns for her third straight season as the UCSD head coach. VanDerveer, who has built up an illustrious resume in coaching, no doubt has the knowledge, experience and leadership skills to push the Tritons to a better finish than last season. While she led UCSD to a solid 22–11 record and second-place finish in conference during her first year, last season’s bitter postseason exit appeared as a disappointing finish. Betsy Butterick and Chelsea Carlisle will return as assistant coaches, while recent Point Loma Nazarene University graduate Savannah Erskine will join VanDerveer’s staff this season as the third assistant coach. Outlook: With a more than capable returning squad, the Tritons have potential to do serious damage in the 2014–2015 campaign. While a preseason poll pegged UCSD to finish fourth in conference standings, the squad can easily exceed such expectations. While last year’s league title-winner Cal Poly Pomona looks poised to repeat, there is no telling what upsets the Tritons can manufacture this year. 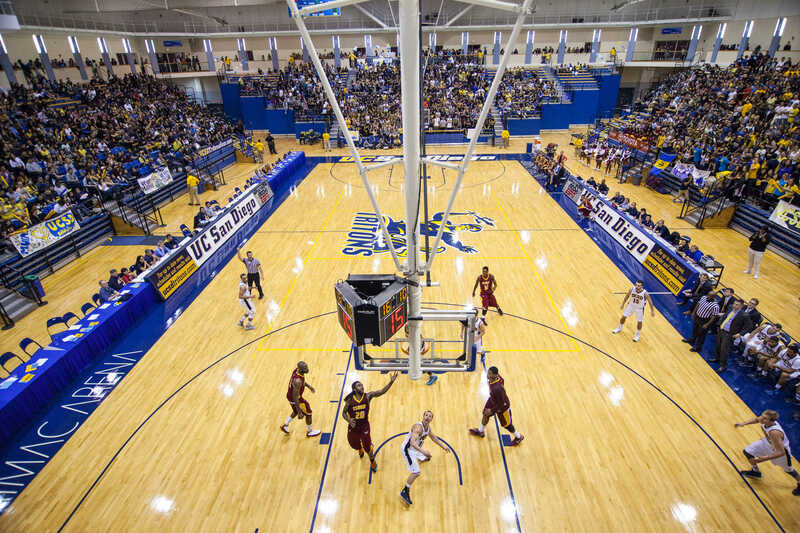 Men’s Team: With the new season upon us, the UCSD men’s basketball team returns to the court with a returning core lineup and numerous new faces. Losing the team’s leading scorer James McCann and the team’s leading rebounder MacKenzie McCullough to graduation, the Tritons will have large shoes to fill this upcoming season. Taking the reigns as team leader will most likely be junior forward Drew Dyer. Last season, Dyer averaged 12.2 points and 5.6 rebounds while also performing when it mattered most, hitting a buzzer-beating shot at Chico State. Sophomore guard Adam Klie will also be met with high expectations. The California Collegiate Athletic Association Freshman of the Year averaged 10.1 points and 3.7 in 28 minutes of play and is expect to see more minutes and build on his stellar first season. Junior guard Hunter Walker, who posted 9.2 points and 4.7 rebounds while also leading the team in blocks and second in steals, looks to have another breakout season. Freshmen guards George Buaku and Grant Jackson will have ample opportunities to prove that they, despite their inexperience, can each assume the role of a facilitating point guard, while junior guard Aleks Lipovic will be at the other end of those passes for a three-pointer, shooting consistently well last year, making 145 from beyond the arc on a team high 0.434. Coaches: Eric Olen returns in his second season as head coach after spending the previous nine years as an assistant for the Tritons. Last season, Olen led the Tritons to a 15–11 season, just one game shy of making the CCAA playoffs. The Tritons were predicted to finish 11th in conference last season but finished at a well-deserved seventh place. Joining Olen as first year assitant coaches will be former Triton Clint Allard and Brendan Clowry. Allard spent the past two seasons as an assistant head coach at Cal Poly Pomona, where the Broncos went 41–10 during his stint. Brendan Clowry most recently was an assistant coach at Point Loma Nazarene University in San Diego. Outlook: With so many new faces and such a young team, the Tritons will have its fair share of struggles early on in the season. However, the Tritons will show glimpses of the strong team they can become for the next few years. Despite being predicted to finish ninth in conference this season, it will not be surprising to see Olen and his team exceed expectations again in a race to make the postseason as the underdogs of the conference.